This tree native to coastal area north from about Cardwell, is readily recognised by the wings on the petioles of the large leaves, and the reddish-brown papery bark which peels off in thin sheets, finer than tissue paper. 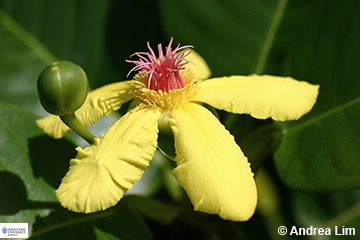 The flowers up to about 7 cm across have 5 yellow petals, numerous stamens topped by numerous pinkish coloured styles. 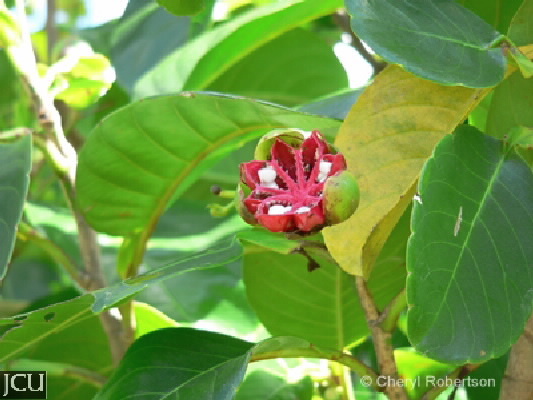 The fruits are red and the carpels open out to reveal the seeds , these are nearly covered by a white aril. Likes to grow where it has access to water.